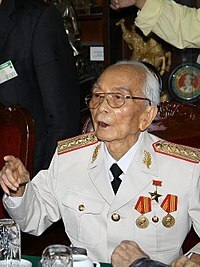 Võ Nguyên Giáp (25 August 1911 – 4 October 2013) was a general in the Vietnam People's Army and a politician. He fought during World War II, where he served as the military leader of the Viet Minh resistance against the Japanese occupation of Vietnam. Giap was a principal commander in two wars: the First Indochina War (1946–54) and the Vietnam War (1960–75). He fought in the following historically significant battles: Lạng Sơn (1950), Hòa Bình (1951–52), Điện Biên Phủ (1954), the Tết Offensive (1968), the Easter Offensive (1972), and the final Ho Chi Minh Campaign (1975). Võ Nguyên Giáp was also a teacher and a journalist, an interior minister in President Hồ Chí Minh's Việt Minh government, the military commander of the Viet Minh, the commander of the People's Army of Vietnam (PAVN), and defense minister. He also served as a member of the Politburo of the Vietnam Workers' Party, which in 1976 became the Communist Party of Vietnam. ↑ "Legendary Vietnam Gen. Vo Nguyen Giap Dies". Associated Press. Retrieved 4 October 2013. Wikimedia Commons has media related to Vo Nguyen Giap. Booknotes interview with Peter MacDonald on Giap: The Victor in Vietnam, 29 August 1993. This page was last changed on 14 February 2018, at 21:56.